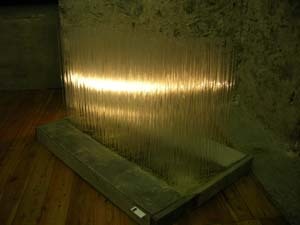 Abitare il Confine (living the border) is a "Must See" exhibition! 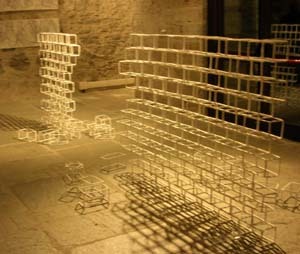 A collection of works from young artists from Europe. A clever mix of sculpture, painting and installation works cunningly juxtaposed amongst the stuffed animal collection in the Governors Palace. 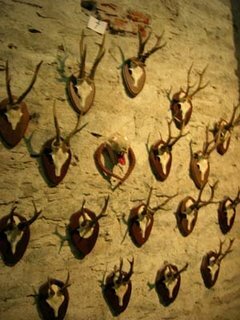 Irony seems to play a strong role be it the "wall" made of wire frame "bricks" or the barbed wire made from papier mache to the "alternative" hunting trophies hidden amongst the real taxidermy. There is something for everyone. The exhibition is on show until the 30th November so time is limited. Just hop on a plane,train or bike and hot foot it to Fenestrelle just an hour from Turin. You could even stay for a few days and take in the delights that the val Chisone can offer, stroll in the mountains or visit a museum or two. There is always plenty to do!